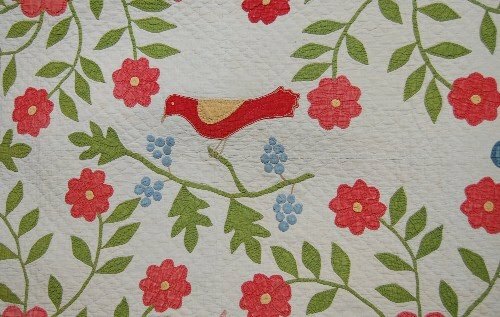 I seem to be a 'bird brain' when it comes to antique quilts (and modern and repro quilts too but that is for another day). 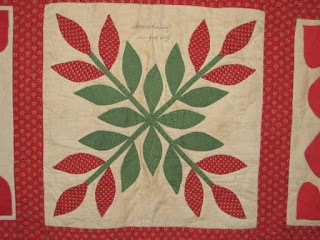 The first 2 photos are from my Quilted Joy/Rose of Sharon quilt, c. 1860 from Ohio. And this little charmer with the teeny tail feathers is from my Whig Rose crib quilt. **Note here is another example of a two step green (yellow and blue make green) but the yellow has gone in places leaving blue and the blue has dropped leaving a yellow/green. 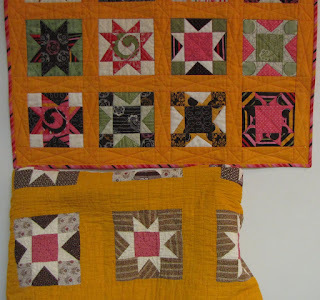 Did I mention I LOVE antique cheddar quilts and remaking them as well? I DO! Thought I'd share a bit of my collection. 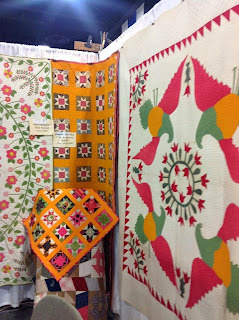 A bit of my quilt appraisal booth highlighting my love affair with cheddar quilts. 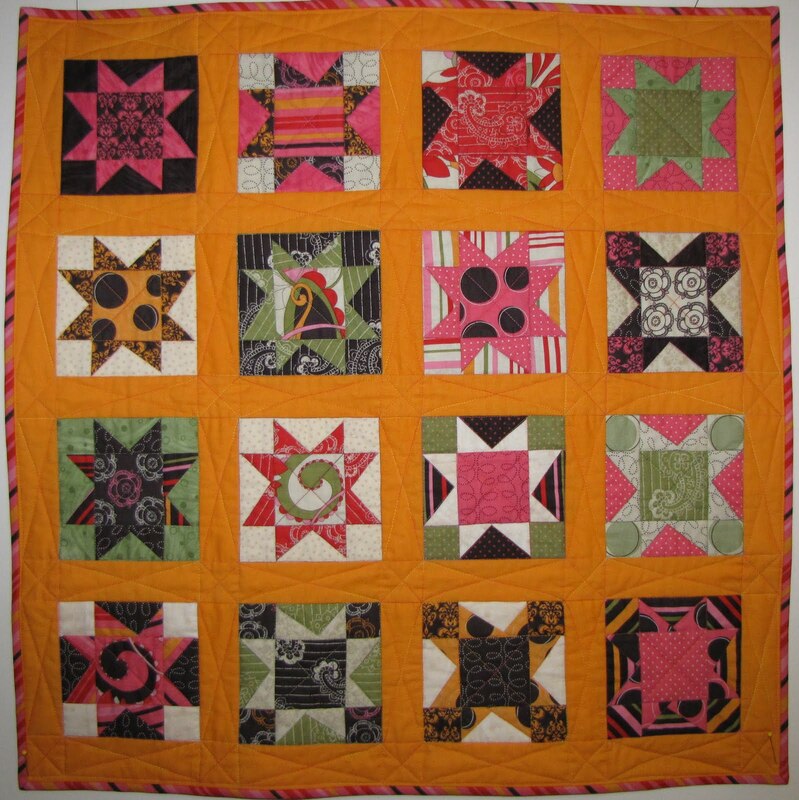 As I've mentioned previously, I love to make challenge quilts - quilts made for challenges issued by fabric companies, quilt shows, guilds, organizations, etc. 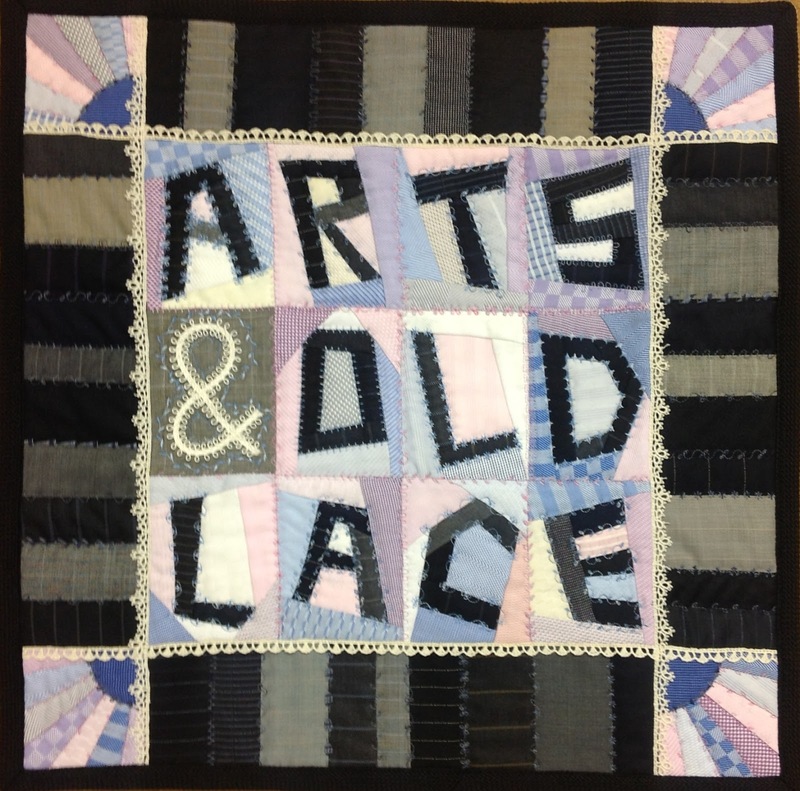 A couple of years ago Artistic Artifacts issued the Arts and Old Lace challenge and this is the quilt I created. Part of my Rising to the Challenge trunk show/lecture. Here are the materials I received to create my quilt - lots of suiting samples paired with summery stripes and seersuckers and buttons and lace. One of my favorite techniques is to take the challenge literally and spell it out in paper pieced letters. 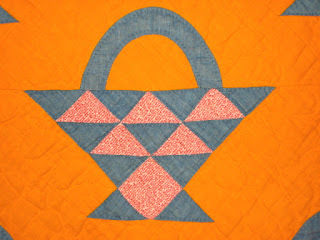 I used fancy stitches on my machine to highlight the letters and quilt the quilt at the same time. I used the lace to frame the center of the quilt. I hope you'll be inspired to find a quilt challenge and create your own masterpiece! 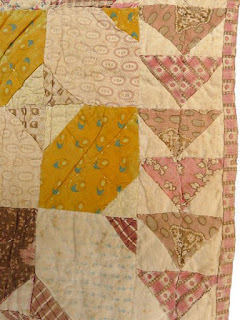 My early antique strippy Flying Geese quilt with alternating stripes of mallard drake and hen fabric that was printed in the 1790s by Talwin & Foster in Banister Hall in England. And here's more of the antique quilt. 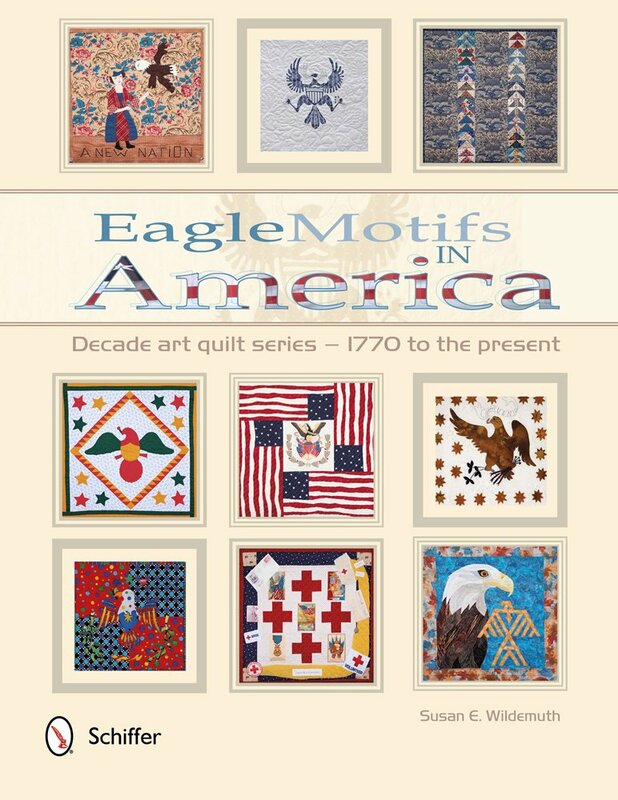 I was invited to participate in Sue Wildemuth's Eagle Quilts By the Decades Quilt project and I picked the 1830s and used the antique quilt above as my inspiration. I substituted an eagle pillar print for the ducks and made pairs of flying geese. Birds all around!! The antique inspiration and the modern makeover getting acquainted before the eagle flew away to Sue's collection. It was an honor to be commissioned to create this quilt and to be featured in the book and even on the cover. The book is available on amazon. 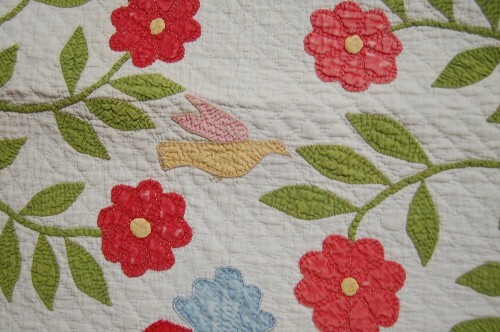 Here's a detail of the quilt and the eagle pillar print. 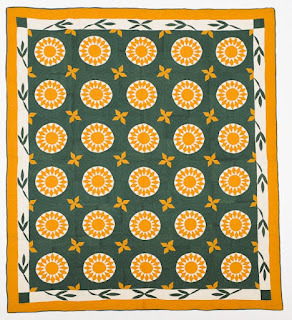 The dark print with cheddar was 1st printed in 1881 by Hamilton Printworks so fairly easy to give the quilt an approximate date. This uneven 9 patch or Puss in the Corner or Sheepsfold always makes me smile! 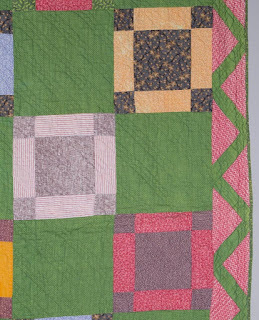 The wonderful zigzag border really makes it sing as does green/pink combo and the cheddar accents. **note for those making antique reproduction quilts** You can never go wrong with a zigzag border . They are crowd-pleasers! 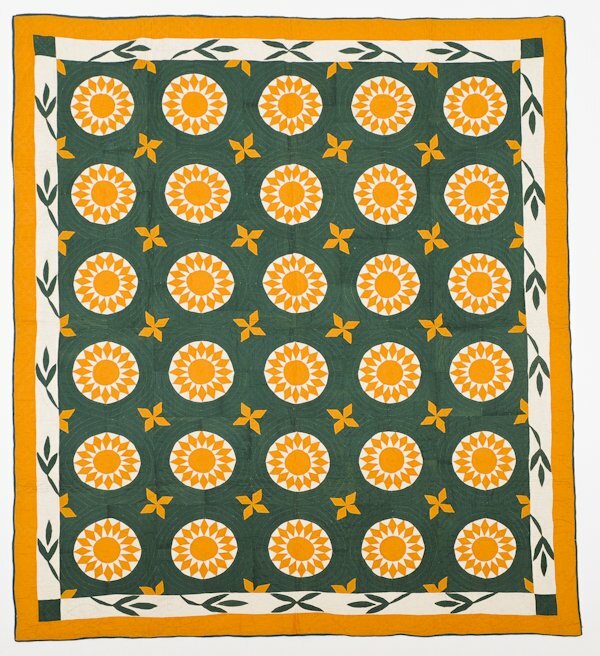 I collect almost exclusively 1800s quilts with a few from the early 1900s and I generally make antique reproduction quilts but I also like to shake things up and make more modern makeover quilts. I also occasionally make even more modern quilts, landscape quilts inspired by the beauty of Moab, funky and folky quilts too. 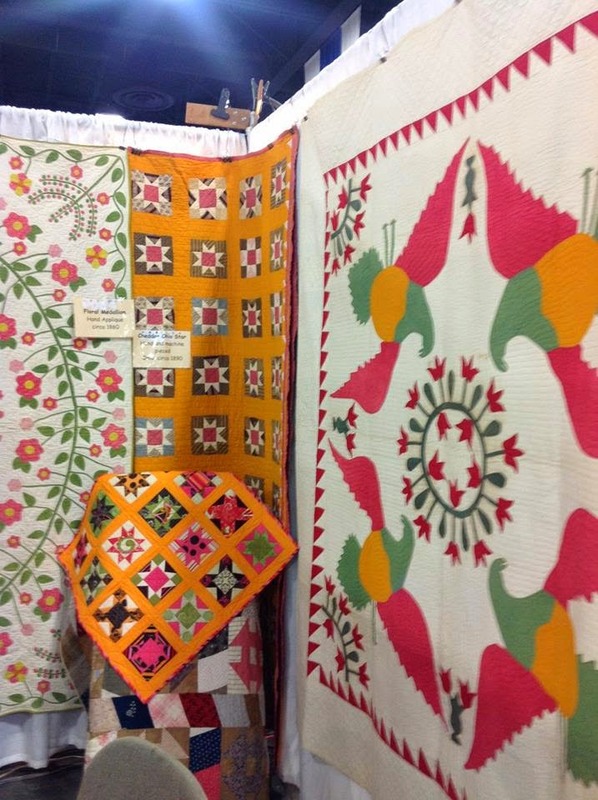 This quilt was made for the Home Machine Quilting Show Riley Blake Challenge and as you can see the fabrics were a wild combination of colors and prints from stripes to giant polka dots and paisleys. 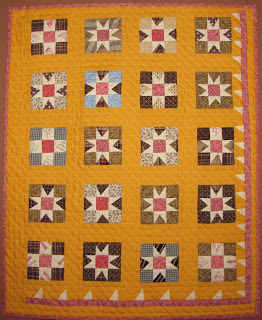 I was playing with cheddar fabrics for a traditional star project and found that this bright cheddar worked with the challenge fabrics and that the antique star pattern was a great fit too. 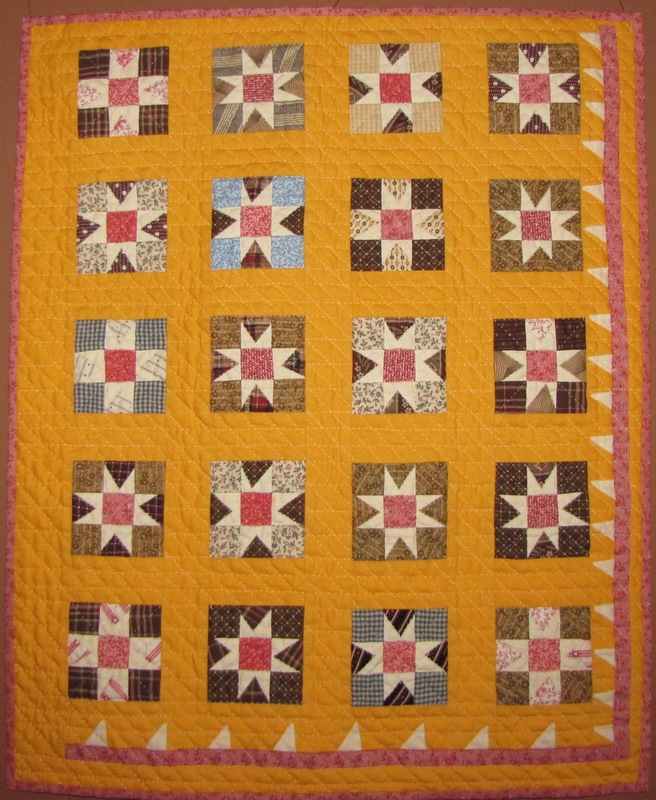 Here is the antique inspiration quilt from my antique star quilt collection. 1890 cheddar star from Ohio. 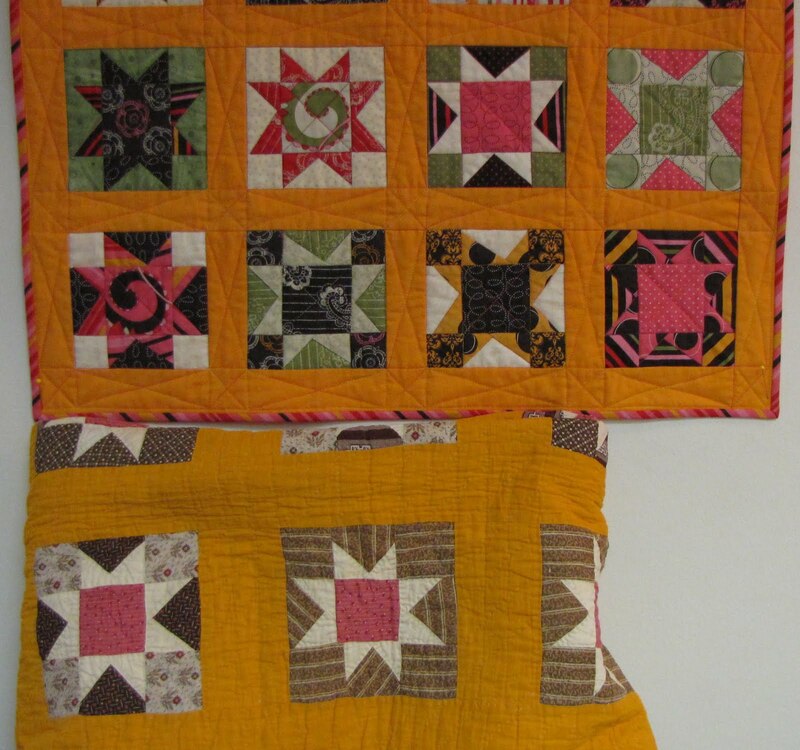 And here are the two quilts, old and new, getting acquainted. 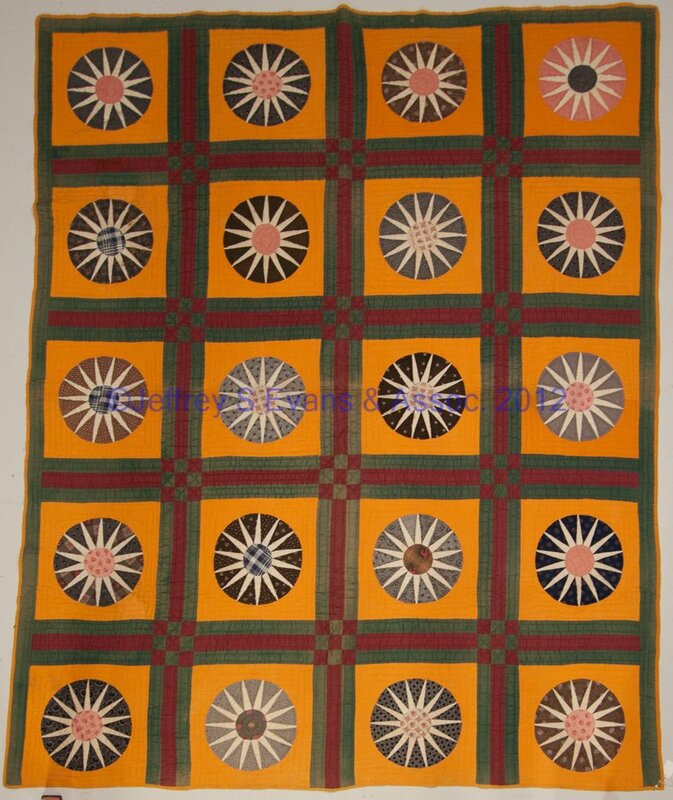 If you'd like to make your own cheddar star quilt (or any other color), a paper piecing pattern is available at my etsy shop. And yes, I also made the traditional miniature version and there is a pattern for it too. 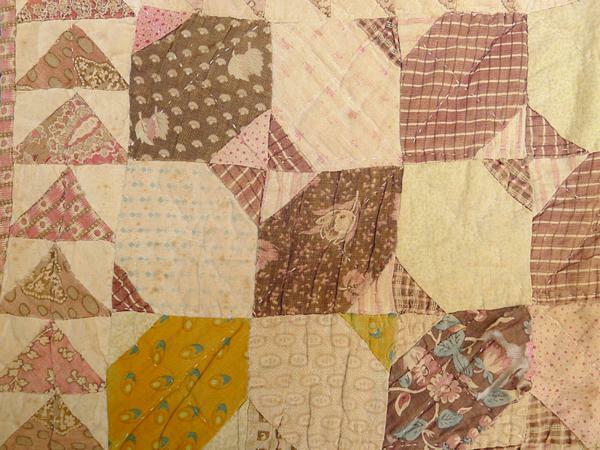 When I purchased the antique X signature quilt (Old Italian Block), I knew it was a multi-generational project because the blocks were from the 1840s or early 1850s but this wonderful faux patchwork cheater print backing was from the late 1800s (1890). 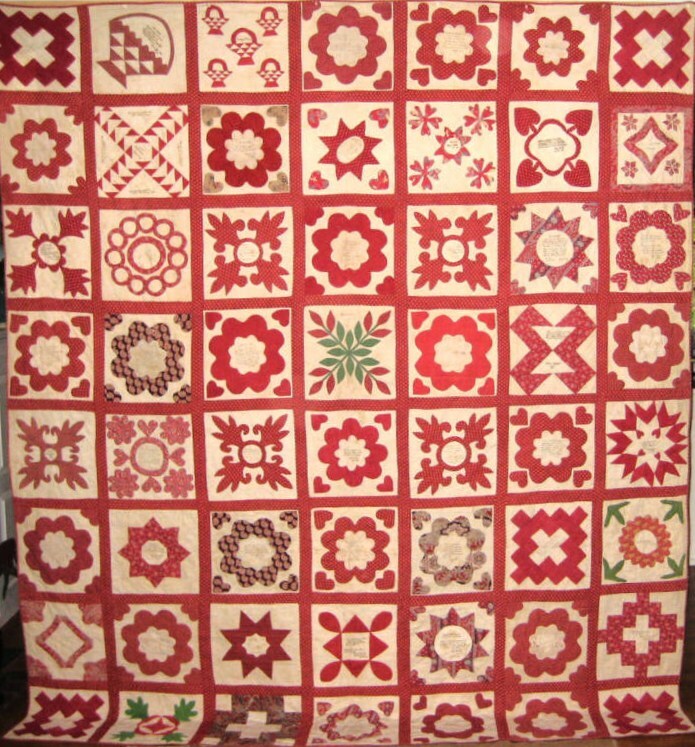 And this burgundy/claret red border was definitely newer too, also from the late 1800s. 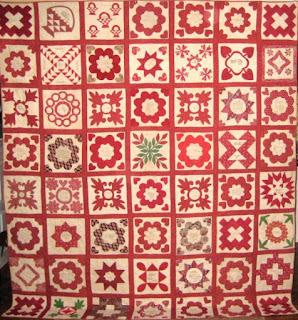 But the quilt simply appeared to have been finished later with the newer border and backing added and a thin batting and hand quilted. It wasn't at all thick and the quilting stitches were small and tight. BUT ... it was SUPER HEAVY!! 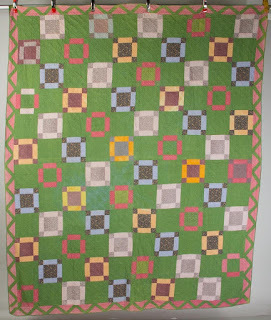 I have enough quilts to know what they should weigh especially with lowloft battings and this one was HEAVY!! And one day after recording names on several signature quilts for genealogical research, curiosity got the best of me and I grabbed a seam ripper and got to work! I was super surprised to find a fully quilted quilt inside. 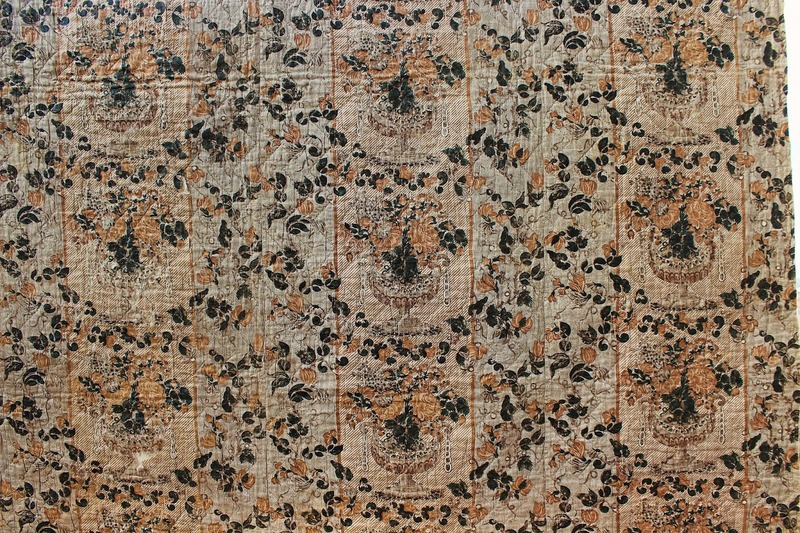 A beautiful decorative furniture print chintz from about 1825 with a linen backing. 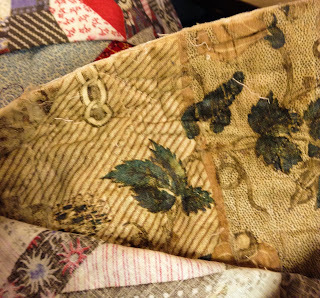 No wonder it was so heavy - there were five (5) layers in the quilt: 2 fronts, 2 backings, and 1 batting. And linen is heavier than regular cotton. Unquilting it was a daunting and extremely tedious task. It was tightly hand quilted and I admit that at least one seam ripper was harmed in the process but I now have a lightweight top for my signature quilt lecture and great piece of 1890 cheater cloth and an amazing early chintz quilt! 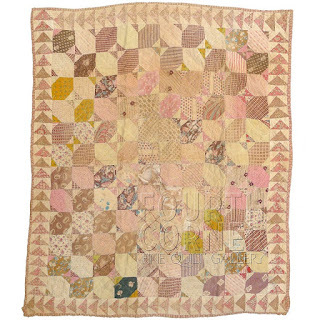 I'll always think of yesterday's X quilt as X marks the spot as it contained a hidden treasure: a glorious early chintz quilt in a wonderful urn pattern with a linen backing. Here's a close-up but be sure to also click on it to enlarge it and see all the detail. The ground of the stripe on either side of the urn is a fine picotage (delicate dots) and behind the urn is a diagonal stripe. 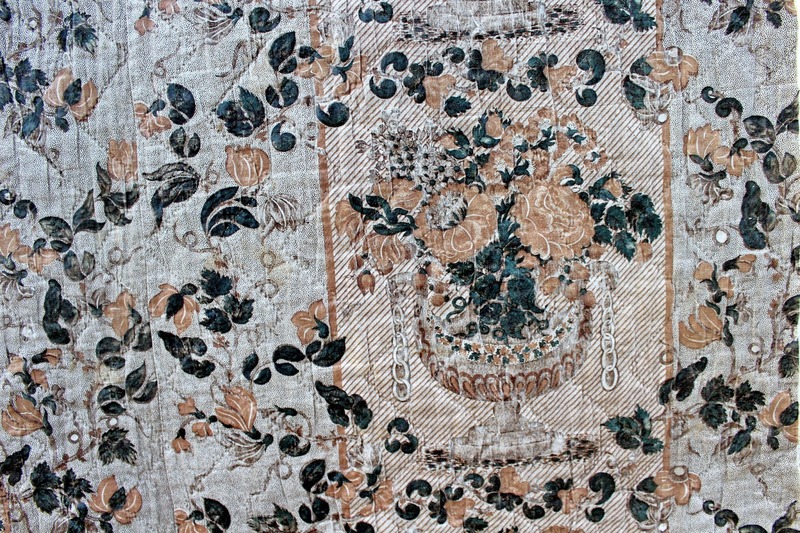 Here's more of the antique chintz in all its glory! 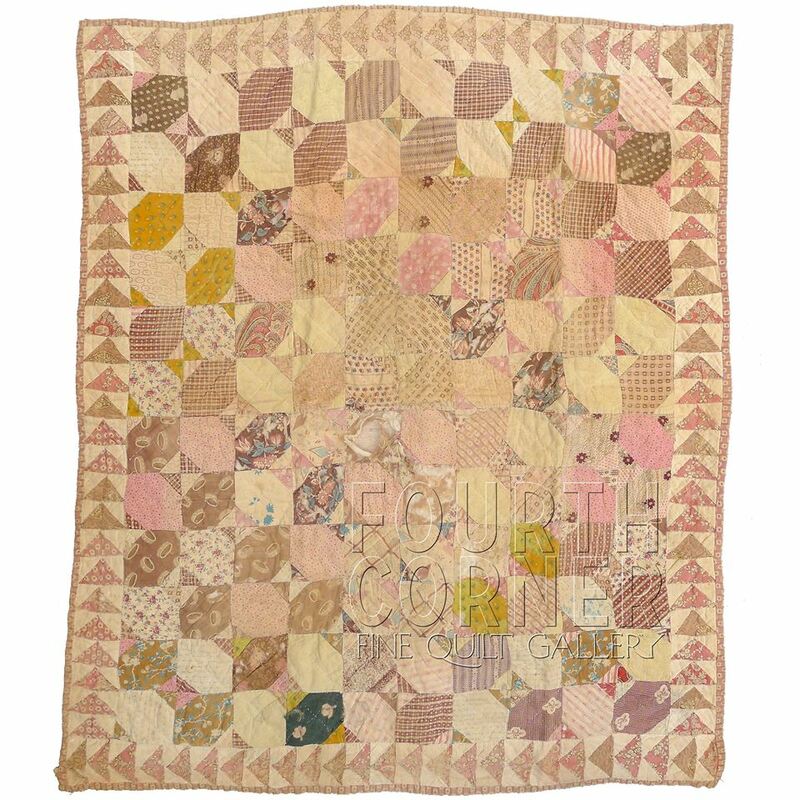 This X block or "Old Italian Block" signature quilt is a wonderful combination of Turkey Red prints and light blues (some double/Lancaster blues). It is from Bucks Co. Pennsylvania and the main family name is VanZant or VanSant. Most of the names were applied via signature stamps. Here's an eagle stamp. And more of the beautiful Turkey Reds. That paisley print is lovely and so is the blue and red stripe. And even more of the reds and blue and signatures. The top left name is D.W.B. Goodno stenciled inside a leaf shape. 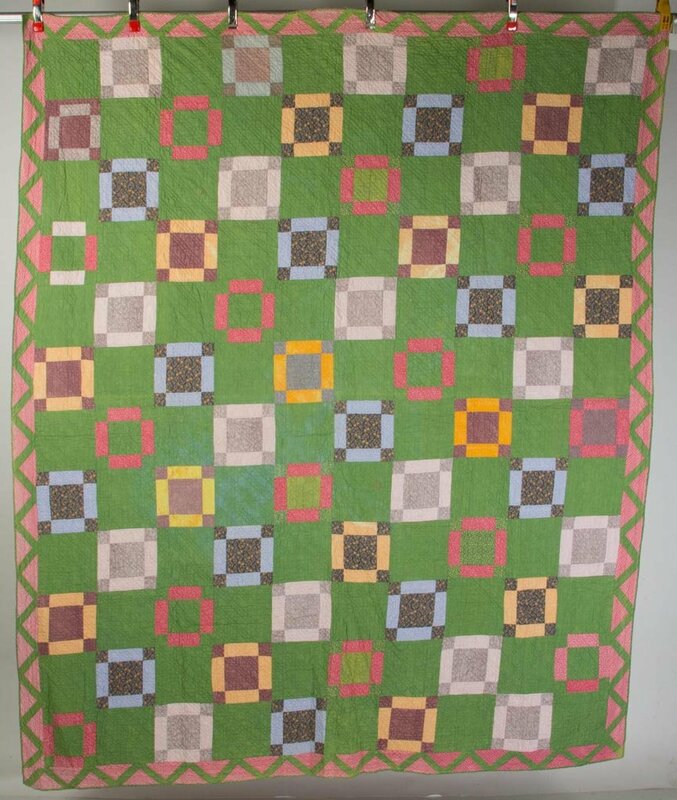 Wonderful antique signature quilt made for a beloved Methodist Episcopal Sunday School teacher, Esther McAllister in New York City in 1858. Click on photo to enlarge and read this moving poem showing how much the group loved their teacher. 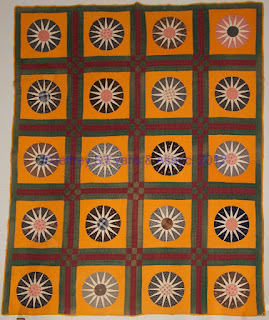 The full quilt, dated 1858, made by the Willet Street Methodist church. Such a charming little antique treasure! The diagonal seams create a bowtie effect and you can never go wrong with a flying geese border. **And note, as I mentioned previously, the mix of prints and plaids/checks. Don't forget that when you are making reproduction quilts. 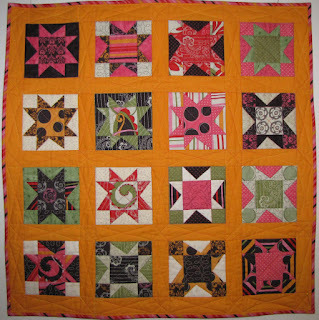 And a closeup of the the blocks and borders. 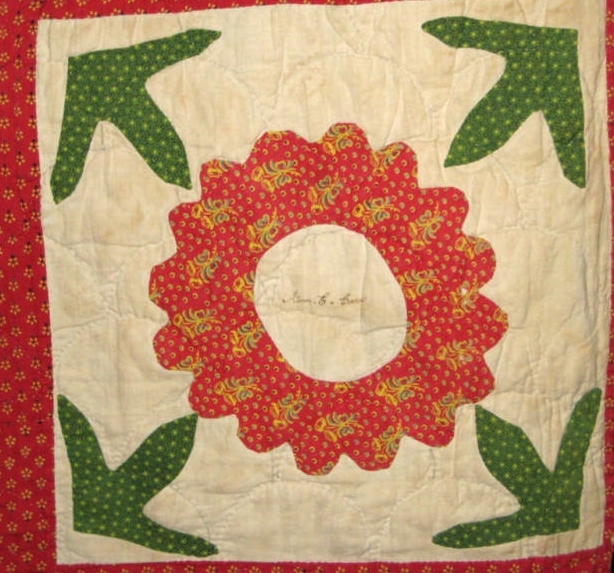 Lily block center of a charming little crib quilt made for a clearly cherished child in the 1840s. Starley quilt collection, part of my Sweet Little Things antique quilt study class or trunk show and also my Birds and Blooms show. This is another example of a two step green (yellow + blue = green) where the yellow has gone leaving the blue behind. And the flower is a Turkey Red print. 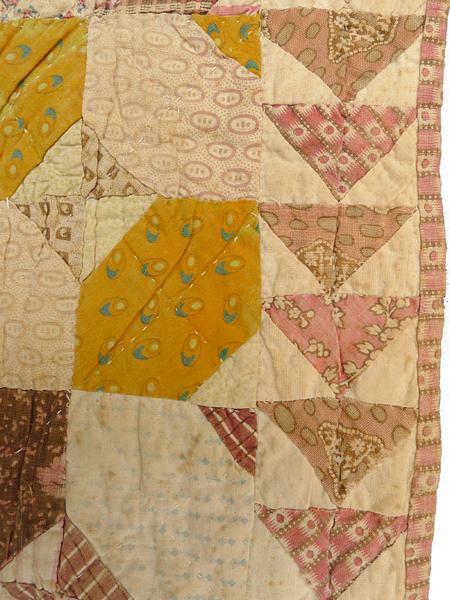 Detail of the blocks and the beautiful chintz floral border. 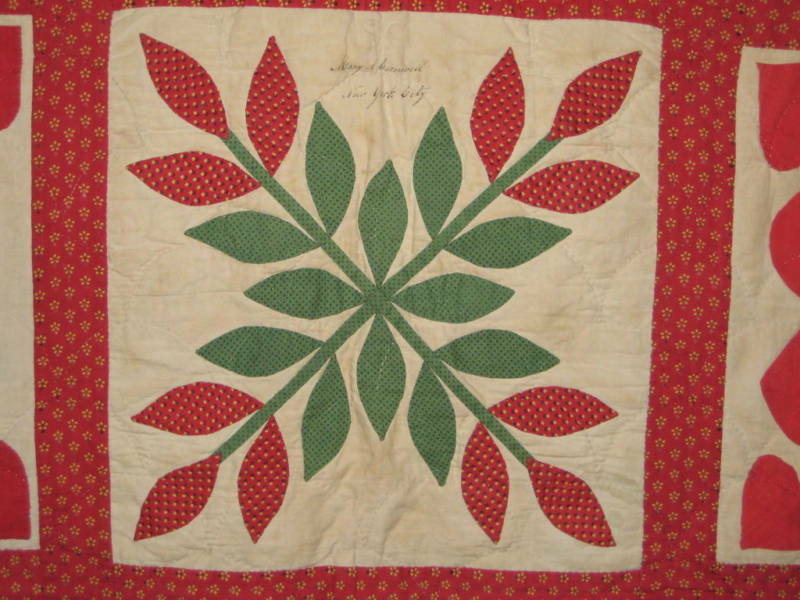 See yesterday's post for more about this chimney album quilt from Delaware and Pennsylvania and dated in the 1840s. I also shared different close-ups of the signatures. Part of my popular Sign of the Times, antique signature quilt study lecture or class. 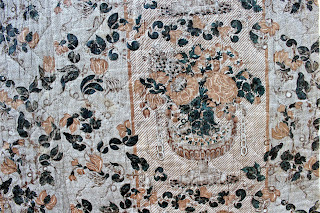 An amazing opportunity to see these treasures up close, hands on, in the cloth! 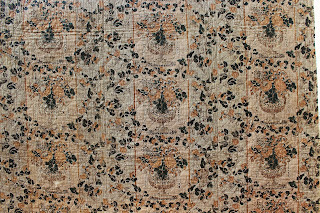 The detailed leaf sashing fabric is stunning! **The signatures from yesterday were hand drawn but this block was done with a signature stamp. 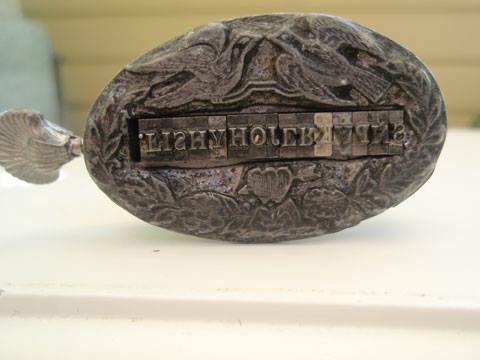 And here's the type of signature stamp used at the time - I share several of these in my trunk show.